The hotel staff were friendly and helpful. The condition of the room was also good (e.g., clean and comfortable). However, it was noted that they didn’t restock some of the toiletries that were used. The separate toilet and shower area was a little inconvenient as well for non-couples. The food variety at breakfast was so-so. Nevertheless, it was an overall pleasant stay at the hotel. Great value for money. One minor point phone was not answered. Where to find Jimbaran hotels near an airport? How can I find hotels in different Jimbaran neighborhoods? Where can I find hotels in Jimbaran that are near tourist attractions? Room options are in generous supply in Jimbaran. We currently offer at least 1047 comfortable places to unpack your bags within 0.1 kilometres (0.06 miles) of Jimbaran's center. 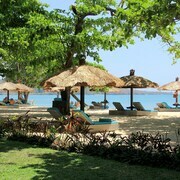 Among the more central lodgings of downtown Jimbaran are the Ahimsa Beach and Kayumanis Jimbaran Private Estate & Spa. Families, students and those watching their dollars can choose from nice Jimbaran accommodation options that won't blow holes in their wallets. The BALQUISSE Heritage Hotel is 1 kilometre (1 mile) from downtown, while the Lumbini Luxury Villas and Spa is 3 kilometres (2 miles) away. Additional budget room options are the Kupu Kupu Jimbaran - Beach Club and Spa by L'OCCITANE and the Bali Baliku Beach Front Luxury Private Pool Villas. 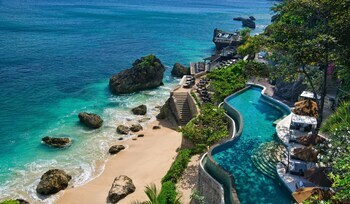 Check out the Bulgari Resort Bali and the The Edge Bali. 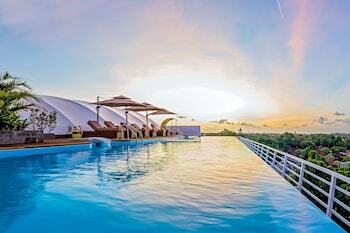 The Bulgari Resort Bali is situated 10 kilometres (6 miles) away from the middle of Jimbaran. The The Edge Bali, is positioned 10 kilometres (6 miles) away. 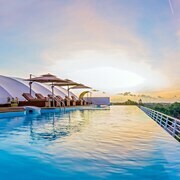 Another possibility is to make a booking at the C151 Luxury Villas Dreamland or the Semara Luxury Villa Resort Uluwatu. 5 kilometres (3 miles) to the north of Jimbaran you'll find Kuta, where you can find Beachwalk and Discovery Shopping Mall. Expedia-listed Kuta hotels and accommodations are the The Legian, Bali and Peppers Seminyak. Or, you could stay in Buleleng, 75 kilometres (45 miles) to the north of Jimbaran, where you'll find the Puri Bagus Lovina and Puri Saron Baruna Beach. The Lovina Beach and Dolphin Monument are just some of the more popular sites to explore should you visit Buleleng. Consider spending a few hours hanging out with fellow sports fans at a local match. You'll find Garuda Wisnu Kencana Cultural Park 4 kilometres (3 miles) to the south of Jimbaran. 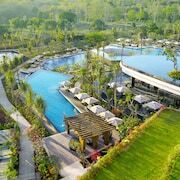 Those sports fans wishing to find a bed near to the action can make a choice from the Banyan Tree Ungasan or the Four Seasons Resort Bali at Jimbaran Bay. For those travelers planning on arriving or departing via Ngurah Rai International Airport, you may like to book a bed at Temple Hill Residence Villa, or Karma Jimbaran, both of which are close. 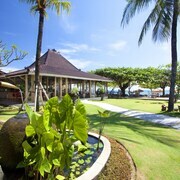 What are the most popular Jimbaran hotels? 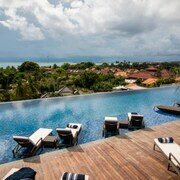 Are there hotels in other cities near Jimbaran? What other types of accommodations are available in Jimbaran? 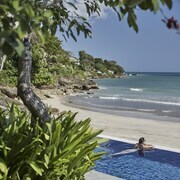 Explore Jimbaran with Expedia.ca’s Travel Guides to find the best flights, cars, holiday packages and more!